This fine short sword is Indian, mid 19C. 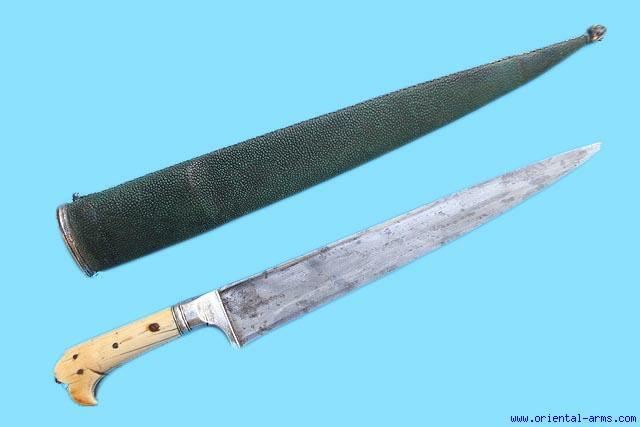 Khyber knife style and shape. 12 inches blade, finely forged and with heat hardened edge. Ivory grips with silver bolsters and grip strap. Original leather covered (green dyed) sewed on the spine side with silver wires and silver strip. Silver mounts. Total length 19 inches. Very good plus condition. Blackened areas on the blade, but no pitting. Very impressive sword.